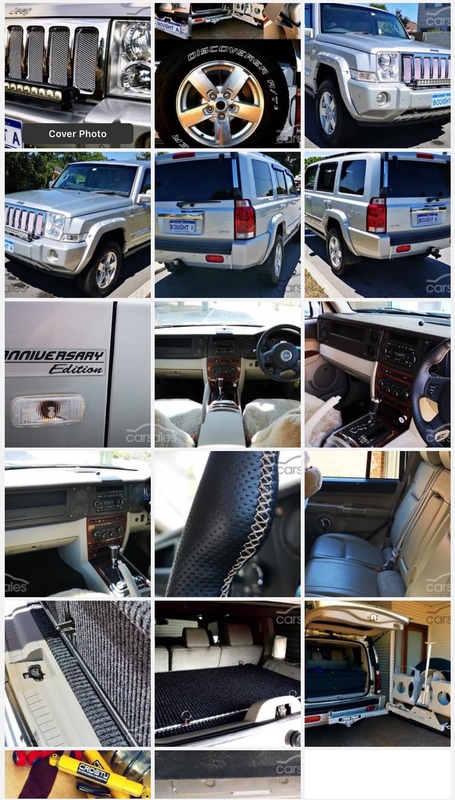 Jeep Commander CRD Limited Anniversary Edition 2008. GDE tune, more. Power, efficiency, and better peddle response. Much more progressive. Custom rear drawer, with tie down tracks to secure items on top. Aluminium frame with solid marine grade ply construction. Covered in HD marine grade carpet. 3rd row seats removed. Wrapped in garage in as new condition. LRA brand 110lt long-range aux tank, feeds to main tank. Top quality QVEE light bar. Headlight and driving light lenses restored. CRD STU Suspension mild 2 inch lift with JBA upper control arms, rear also has airbag man airbags in rear coils for extra support when needed. CRD STU oil sump and steering pump protection. Tyretrek read tyre carrier, with dual custom jerry can holders and cans. All colour matched powder coated. Steering wheel retrim with perforated leather and thumb grabs. Thicker and much more comfortable. Ram mount ipad holder interchangeable with phone dash mount. Both supplied with purchase. Changed out front grill with mesh, given withering plastic. Rhino roof racks and oval chrome side steps supplied though not fitted. Serviced with receipts and ipad records of self servicing. Self service due to locations I have lived and not trusting the average stealer-ship. Comes with K and N oil filter, air filter and hard to find transmission dipstick. Interstate buyers, we can help arrange transport if needed. We have selected RWC included, due to WA rego cars not needing this. We can not help with a RWC for interstate transactions. This with be the buyers responsibility. Sorry dwalker all 4 sale's must be in the 4 sale section. Tapatalk can't post in this section (due to its limited functions) so you need to log on using a browser to make the listing. How may is and what price? All times are GMT +10. The time now is 04:09 AM.